I am a collector and lover of hearts. I take pictures of things shaped like hearts, and notice them all around me. And of course, I've acquired a lot of vintage heart charms and brooches and earrings and pins along the way. I've been picking them up for years and years at estate sales, flea markets, bead shops across the US, and even at some auctions. 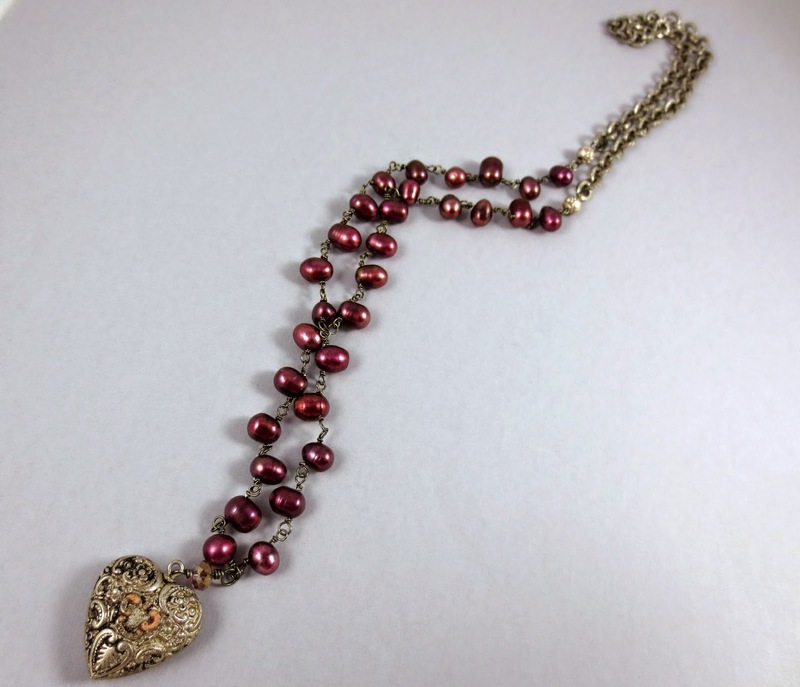 I just made this one of a kind, long necklace using a heart I just love. I don't know what it's made of, but it's worn into it's age and has all sorts of textures and subtle colors to it. Each side is different and beautiful. I love that it's tattered and worn- It looks like it's been through some things, and it's only gotten more charming because of it! I love the "Side B" the best- I like how part of the silver has actually worn away and the pinkish clay or whatever it is, has come to the surface. 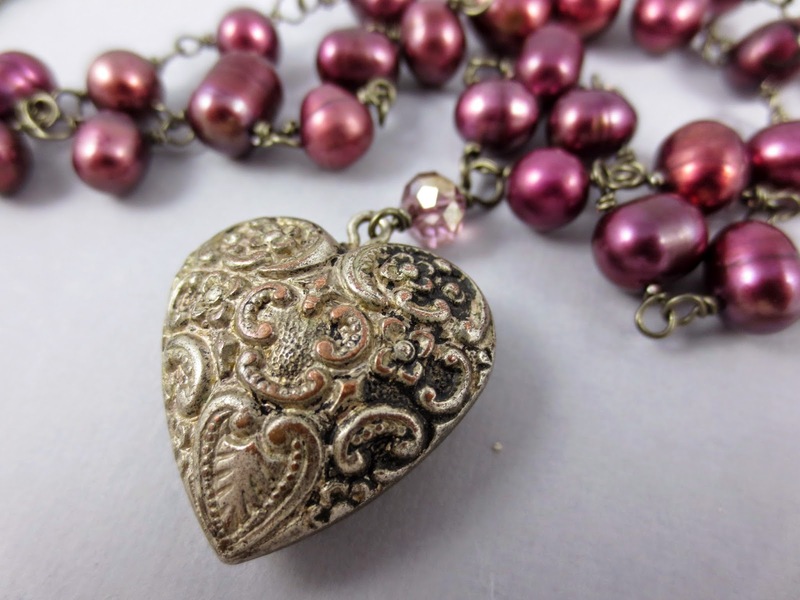 I used purple-ish pink-ish freshwater pearl beads because I thought their color was such a great compliment to the antique silver look of this heart. It's a long necklace, so I wire wrapped a lot of those pearls. I think they ended up sort of looking like old rosary beads. The back half of the necklace is a repurposed silver chunky necklace I found at an estate sale recently. 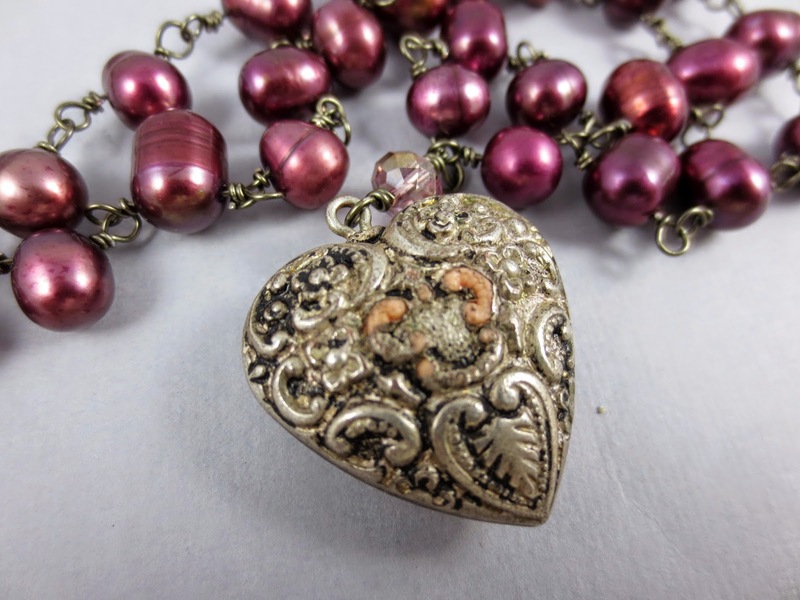 It's got some texture to it as well, so it seemed the perfect compliment to the heart charm. The necklace, like I said, is long. It measures about 28 inches (71.12 cm) around, and falls about 5 inches above my belly button. It's for sale in my Etsy shop today- Resparkable Vintage, for $55. Click HERE to see more photos and a more detailed description if you're interested in purchasing! The Heast Castle- Shoes and Dresses!